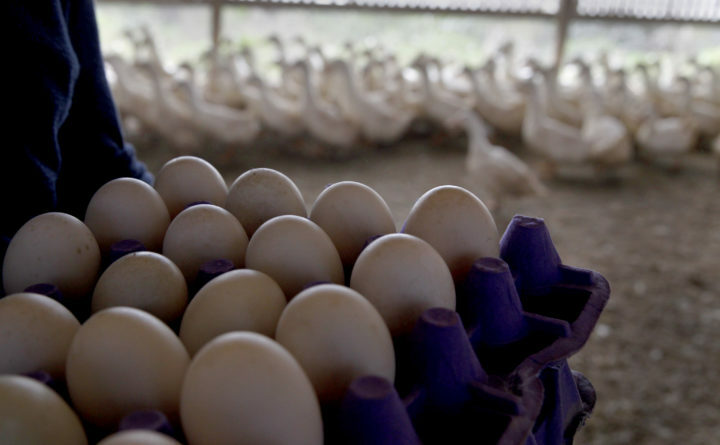 Federal officials say nearly 207 million eggs have been recalled because of fears they may have been contaminated with salmonella, a type of bacteria that causes serious illnesses and deaths, particularly among children and elderly people. Rose Acre Farms is recalling the products after federal officials tied illnesses to the company’s facility in North Carolina, the U.S. Food and Drug Administration said. Twenty-two people on the East Coast have been sickened by Salmonella braenderup. No one has died. An investigation by the federal agency led to an inspection of the farm, which is located in Hyde County, North Carolina, and produces 2.3 million eggs a day from 3 million hens. Eggs produced at the farm are distributed to retail stores and restaurants in Colorado, Florida, New Jersey, Pennsylvania, Virginia, West Virginia and the Carolinas. The recalled eggs were sold under brand names such as Great Value, Country Daybreak, Glenview and Food Lion. They were also sold to Waffle House restaurants. Rose Acre Farms is a family-owned company headquartered in Seymour, Indiana, and has 17 facilities in eight states. The Washington Post was unable to reach the company Sunday. The recall is the largest since 2010, when a major salmonella outbreak tied to Iowa egg farms sickened more than 1,500 people, according to Food Safety News, a website created by Bill Marler, a personal injury attorney who focuses on foodborne illness litigation. More than 500 eggs from two Iowa farms owned and controlled by Austin J. DeCoster were recalled that year. DeCoster and his son, Peter DeCoster, each pleaded guilty to one count of introducing adulterated food into interstate commerce. Authorities said the DeCosters’ company, Quality Egg, sold eggs contaminated with Salmonella enteriditis to several states and bribed an inspector for the U.S. Department of Agriculture in an attempt to sell eggs that were “red tagged” for failing to meet minimum industry standards. The father and son were sentenced to three months in jail. According to the Centers for Disease Control and Prevention, salmonella causes about 1.2 million illnesses, 23,000 hospitalizations and 450 deaths every year in the United States. The Rose Acre Farms recall is the latest in a series of salmonella-related incidents in recent months. Earlier this month, the Food and Drug Administration ordered a mandatory recall of all food products that contained powdered kratom after investigators found that several products manufactured by Las Vegas-based Triangle Pharmanaturals contained salmonella. The outbreak spread to nearly 40 states and sickened 132 people. Kratom or Mitragyna speciosa, an unregulated herbal supplement used to treat pain, anxiety, depression and symptoms of opioid withdrawal, has also been linked to three dozen non-salmonella-related deaths. Last month, the CDC investigated another salmonella outbreak that involved raw coconut and sickened 13 people in eight states. International Harvest Inc., based in Mount Vernon, New York, recalled bags and bulk packages of Organic Go Smile! Raw Coconut because of potential salmonella contamination. In February, Triple T Specialty Meats, based in Ackley, Iowa, recalled more than 20,000 pounds of ready-to-eat chicken salad products that may have been contaminated with salmonella. The outbreak resulted in 265 illnesses in eight states. One person died, according to the CDC. Salmonella can come from contaminated animal products such as beef, poultry, milk and eggs, as well as fruits and vegetables. It can cause fever, diarrhea, nausea, vomiting and abdominal pain among healthy people, but can lead to fatal infections among children younger than 5, adults older than 65 and those with weak immune systems. In severe cases, people can suffer arterial infections, endocarditis and arthritis. 2020 Democrats court young voters, but will they show up?